If you’ve ever seen a production directed by Calixto Bieito, imagine what his take on Aufstieg und Fall der Stadt Mahagonny would look like. Congratulations! You are correct. If you haven’t seen any Bieito, imagine the Florida Man Twitter feed as rewritten by Michel Houellebecq. Take out all the gators, because local color isn’t on Bieito’s agenda. However, somebody’s face is perpetually in danger of being eaten. Tchaikovsky’s The Queen of Spades is an opera that swerves between the apparently conventional and the obviously unsettling. As Dostoevskian antihero Herman crashes through 1790s St. Petersburg in search of the three cards that will always win, we can never quite tell what’s real and what’s the product of his feverish, anachronistic mind. And that’s before Stefan Herheim got around to directing it. But now Herheim has, and on the way to Berlin for some work I went to Amsterdam to see it. When you study or teach music history, Christoph Willibald Gluck has a very specific function: he swoops down and cuts through the extravagance of Baroque opera with his reform opera. Most of the works by Gluck performed today are from this reform era, namely both Iphigénie operas, Alceste, and, most famously, Orfeo ed Euridice. They’re beautiful, they’re elegant, they’re austere, they can sometimes be, IMO, rather boring. And honestly that’s kind of the feeling I got when watching it. The “many plot turns” are indeed many and none seem to have a ton of gravity. In usual opera seria fashion, the arias are reactions to these recitative plot twists, and since arias are much more exciting and showy than recit this means you tend to forget why this reacting is happening and just enjoy it (or, er, not enjoy it). Sometimes the characterization is not so much nuanced as just odd: villainous Massimo spends way more time singing lovely lyrical arias about streams and flowers than he does swearing vengeance, even though the plot is basically powered by his tireless and treacherous quest for vengeance. (The emperor tried to seduce his wife.) The arias are almost all da capo affairs. There’s one trio and a little lieto fine ensemble, no chorus or dances. In other words, that’s a lot of arias. So it seems to me that the main attraction is the range of moods and sentiments offered by these arias, not the plot as such. It’s an intriguing but also a peculiar repertoire choice (particularly for a city with a very spotty history of opera–it’s not like everyone could compare it to the Alceste they saw in the fall). Odyssey is a new company that emerged from the wreckage of Opera Boston, and I don’t pretend to understand the complex topography or history of Boston’s many companies. They obviously don’t have huge resources but this was a respectably cast, well played, and musically very credible production. The 900-seat Boston University Theatre (while we still can call it that, while it still exists) is an ideal size for this sort of opera. The small, modern instrument orchestra played with energy and sparkle, and Gil Rose’s conducting was mostly on the speedy side. Staging, however, was another matter. Despite some fine singing, this opera never convinced me of its necessity. Joshua Major’s production was very basic. Jian Jung’s set gave us an indeterminate set of walls and some square columns and Rachel Padula Shufelt’s costumes vaguely mixed modern and ancient Roman elements by way of, for maiden Fulvia, senior prom. It established the relationships between the characters, but the opera never seemed to reflect any kind of larger world or idea. The blocking kept people moving around the stage, but much of it isn’t clearly motivated (character stands up, two flunkies move the cube he was sitting on to a different part of the stage, he goes and sits down there). The direction illuminates the, er, more involved elements of the plot, but it rarely develops stuff beyond their basic motivation. I almost wonder if this is a staging more fit for the lean later Gluck. This utter simplicity is an easier sell with reform opera’s linear action and clear dramatic stakes. But pre-reform opera requires a little more dramatic variety and creativity to make things interesting, and this production ends up being very bland. The best staging in this production is Fulvia’s final aria: for almost the first time, the whole stage darkens and she’s illuminated by a special (a lighting instrument that highlights a particular moment) sitting extreme downstage right. It creates a unique, intimate, dark atmosphere we hadn’t seen before. But most of the arias don’t get this kind of unique treatment and it tends to run together. It also helped that Jennifer Holloway, as Fulvia, gave the strongest performance of the whole cast. From her bio it sounds like she’s not sure right now whether she wants to call herself a soprano or a mezzo, and I’d probably find either label credible: she has a bit of mezzo darkness but not as much as most mezzos, and she occasionally got a chance to sing some soprano-like high notes. More importantly, she sings both musically and dramatically and knows how to make a da capo aria into an emotional journey. She was the only cast member who made a complete performance out of the rather meager staging’s material. The rest of the cast was decent. As Massimo, William Hite sang elegantly and precisely with a Mozartian sort of tenor, but didn’t quite decode this character’s odd mix of paternal protectiveness and reckless vengeance. As Ezio, Brenda Patterson showed a rich, dark mezzo and acted with determination, though perhaps with the scale for a much larger theater. She didn’t always seem comfortable with role’s low tessitura and her ornamentation was sometimes blurred in its coloratura. As Onoria, soprano Erica Petrocelli (a grad student at NEC) has an intriguing and promising instrument, a distinctive and spicy timbre with a bit of an edge to it. She sang quite musically, but always at an aggressive full tilt, and I would have enjoyed a bit more lyricism. As Valetiniano, countertenor Randall Scotting was emphatic. Tenor Jessie Darden as guard Varo has a pleasant voice, to my ears slightly Rossinian. So an experience more musically than dramatically satisfying. Maybe Gluck was right about all this reform stuff. Gluck, Ezio. Odyssey Opera at the Boston University Theatre, 6/3/2016. Full information here. I don’t remember when or why I made this to illustrate Handel’s English oratorio period but it is a thing I did. At some point. For some reason. ? Yesterday I finally checked out Boston’s famed early music scene by going to the Handel and Haydn Society’s performance of Handel’s Saul in Symphony Hall. I sat behind a gentleman with a score and in front of another gentleman who beforehand mansplained the oratorio by invoking Malcolm Gladwell and then during proceeded to sing along at various points in Act 1. * So I guess I don’t know quite what to make of Boston early music audiences yet. Anyway. Proper historically informed orchestras are as rare as hen’s teeth in the US and I was happy to hear a very credible one. The Handel and Haydn orchestra has a rather glassy, close to vibrato-free sound (which you might think is a given but among current groups really is not). The winds are quite accurate and, despite there being quite a few of them in this piece, not too loud. Most importantly, it’s a real orchestra that doesn’t sound like a pickup group. Nor did the smallish but substantial-sounding chorus, whose sound blended very nicely. Conductor and music director Harry Christophers’s priority seemed to be sheer tonal beauty. Sometimes he would draw out a phrase to luxuriate, ridiculous length (most obviously the sigh motive on “virtue” in Jonathan’s first air). Tempos tended toward the slower side side. Choruses were beautifully layered and seemed to stop time. 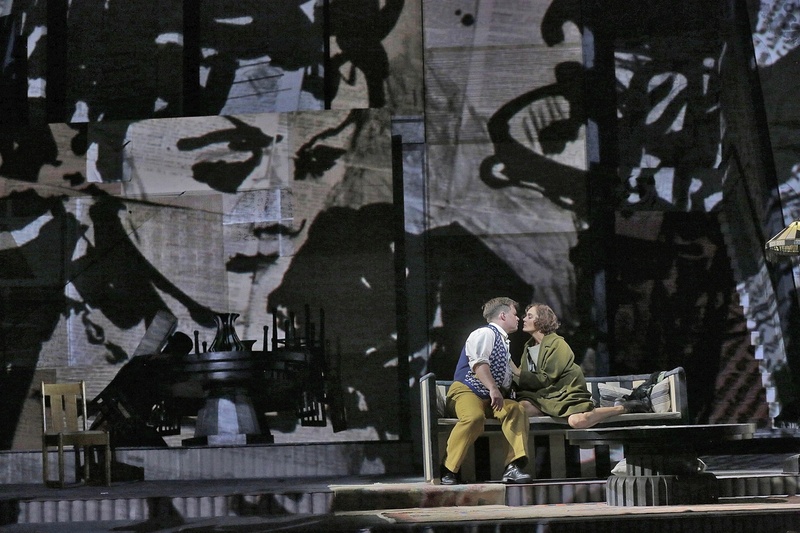 While Saul has a lot of beautifully mournful music, particularly around the last half hour (from the famous “Dead March” on), it’s also a very dramatic piece with madness, love, etc., and frequently receives full staging, for example in this Glyndebourne production last summer. But operatic oratorio wasn’t on the menu here. I must admit that I found Christophers’s placid approach rather bland and at times even boring. There wasn’t much dynamic variation or even differentiation of articulation. Despite a ton of energetic gestures from the concertmaster rhythmic life was often lacking, and I missed the kinds of accents and momentum you can get in this music. There are rage arias here (Saul in particular), a brief appearance by a witch in Act 3, and heroic stuff too, but everything bubbled along at a medium temperature. OK, I’m one of those people who likes René Jacobs, which means I’m a glutton for sforzandos, weird tempo changes, and talkative continuos, and in comparison this Saul was very plain. But you don’t have to take my word for it. Here is Christophers conducting “Let the bright Seraphim” from Handel’s Samson (I believe the soprano is Lynne Dawson). In comparison, here is another recording of the same piece, this one sung by Karina Gauvin and conducted by Alexander Weimann. Christophers and Dawson are very pretty and tidy, but to me, Gauvin and Weimann are sparkier, more alive, and way more interesting. Christophers’s school of Handel certainly has a long tradition, most particularly in the UK (from which almost the entire cast of this performance hailed), but as an opera person I gravitate towards a more operatic approach. Based on audience response, Iestyn Davies as David stole the show. His countertenor is of the ethereal, angelic type (like the orchestra, very little vibrato), and while David is a heroic character Handel gives him a lot of lyrical music. Davies’s voice has wonderful presence in Symphony Hall: light and clear but absolutely filling the space like none of the rest of the cast. This puts him in tune with Christophers, but he also has a sense of character and drama that supplied some of what was otherwise lacking–perhaps he got it from being in that Glyndebourne staging I mentioned above. I also liked Joélle Harvey’s Michal, sung with a very beautiful, limpid tone. She’s a very communicative, earnest singer, though her diction doesn’t always quite back her up. She and Davies blended excellently in their duets. Elizabeth Atherton’s Merab was certainly a contrast to Harvey, but her lean soprano often sounded thin and tight. She improved over the course of the performance, though. As Saul, Jonathan Best sounded appropriately senior and authoritative, but didn’t seem to have the charisma befitting a title character nor the facility to carry off all the coloratura. Finally, Robert Murray was a pleasant Jonathan. This was a totally respectable, sometimes even excellent performance that rarely was fully absorbing. Maybe this is what happens when you go to see Handel after a lot of Elektra but I could have used a little more blood. *I never found out if he sang for the rest because I moved during intermission. In 1697, the Comédie-Italienne almost managed to make fun of the court of Louis XIV but were forcibly disbanded for their trouble. In 1710, André Campra’s opera-ballet Les fêtes vénitiennes tried to bring the italianisme and the politics back to Paris. Last weekend, Les Arts Florissants brought it to New York. The late Patrice Chéreau’s production of Elektra is surely the highlight of this season at the Met. We’ve known that it was going to be for a while. It arrives a known quantity; acclaimed from its European performances, the fame of its director and cast, and its DVD. There’s something off about a “new production” which has already been available on video for a year and a half and whose director died in 2013. Yet I suspect this is how the Met prefers it. As Peter Gelb stated repeatedly in a brief interview during the Manon Lescaut HD broadcast, the Met is in the masterpiece business (he even used this descriptor when discussing new opera, which is a whole different problem). When we roll theater and production into the operatic experience, as Gelb has tried to do, this makes new productions tricky to sell: though new, they also have to embody some of that timeless masterpiece solidity. And importing a brand-name, already-acclaimed Masterpiece from somewhere else (this Elektra is from Aix-en-Provence), is simpler than forging your own from scratch. Lest you think I’m spending too much time thinking about what is essentially marketing copy, let me remind you that this discourse shapes the way much of the Met’s audience thinks and talks about opera (I hear it from students all the time). It’s not that Chéreau, surely one of the most important and influential directors of opera of the past 50 years, doesn’t deserve honorifics or a respectful tribute. It’s that “masterpiece” is a blunt instrument primarily used to confer status. When you’re discussing Elektra, a shabby little shocker with lurid orchestral colors and bodies that are rotting from the inside, that sacred cultural capital becomes even stranger. New startup Suspension has received Series A funding for a plan to reinvigorate and revolutionize the world of classical music and opera. The tech world has not shown a great deal of interest in traditional arts, philanthropic or otherwise, but Suspension CEO Adam Jones’s 4-year old daughter recently started Suzuki viola and he believes it to be an untapped market. “Let’s disrupt opera!” he said. The presentation’s video flashed from black to white to black and the opening of Beethoven’s Symphony No. 5 rang out. “Recently, curators at a small museum in Torre del Lago were rummaging through a closet and found an old smoking jacket. Roll over, Beethoven’s hair, it’s time for Puccini’s fingernail clippings!” The audio obligingly played the opening phrases of Turandot. The company has already sequenced the composer’s DNA and plans to have a baby Puccini by the end of 2016. It will take a while for him to mature, Jones said, but “these guys start early, right?” Musical styles might change in the intervening time, but Puccini 1.0’s music, Jones said, would surely remain popular. “We’re planning on raising him on a diet of John Williams and Nicholas Sparks to shape his compositional style,” Jones added, noting that they were going to be careful about letting Puccini 2.0 hear some of Puccini 1.0’s weirder moments because “he’s not important because of Fanciulla.” The effort is being co-sponsored by the opera houses of New York, San Francisco, Chicago, London, Paris, Milan, Vienna, and Barcelona. Puccini 2.0’s first project is a co-commissioned opera based on Gone Girl. But before Puccini 2.0 will be able to tackle that subject, he reportedly already has a contract to participate in a forthcoming production of Madama Butterfly at the Oper Stuttgart. The house proclaimed themselves uninterested in his compositions but noted that a director wished to cast him as Trouble alongside Michael Volle as Peter Gelb/Sharpless, Anja Harteros as the Ghost of Maria Callas/the Spirit of Opera/Cio-Cio San, and Roberto Alagna. Another branch of Suspension, in conjunction with Opera Extra-Rara, is working on an algorithm that will comb through primo ottocento literature and compose a new Donizetti opera approximately every six weeks. The project employs two musicology postdocs who unwisely claimed digital humanities expertise on their CVs and have to add ornamentation for a personal touch. The project also has two additional musicology postdocs to study the new works’ authenticity and two more postdocs to produce critical editions of the new works. While Puccini 2.0 matures, the company plans to release an Über-like app, Viola, which will allow users to summon a violist to play for any occasion, such as a party, big presentation, or insomnia. The plan currently only offers violists but if successful or even if not successful will deploy bassoonists next. “The gig economy is nothing new for musicians,” Jones said. Puccini’s Manon Lescaut has to be one of the least sympathetic leading ladies in opera: insufficiently malevolent for a villain, too shallow and materialistic to be a heroine (her escape from her rich “patron” is foiled because she refuses to leave without her jewels, jewels she is inexplicably slow at gathering up), and too passive to be an interesting mix of the two. That doesn’t mean her story isn’t worth following, though. She’s a perfect storm of many of the nineteenth century’s least appealing ideas about women and Puccini’s score is loaded with enough high octane drama to keep your attention. With the right production and cast, it can work! Unfortunately the Met’s tepid, confusing new production doesn’t pull it off. 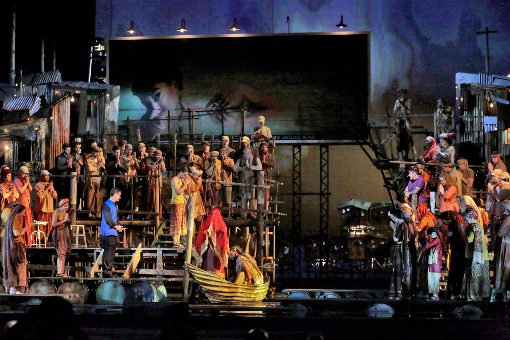 Georges Bizet’s The Pearl Fishers (Les pêcheurs de perles) premiered in Paris in 1863, a full decade before Carmen. Its exotic Indian subcontinent plot, complete with undulating melismas, a chaste coloratura priestess and a disapproving elder priest, inevitably recalls another opera that premiered in Paris exactly twenty years later, Léo Delibes’s Lakmé (which I saw at Opera Holland Park last summer). For modern listeners, Lakmé and Pearl Fishers have another thing in common: they’re both somewhat obscure operas with one or two extremely popular hit numbers. For Lakmé, it’s the Bell Song and Flower Duet, for Pearl Fishers it’s the tenor-baritone duet in which two reunited buddies–one a baritone head pearl fisher, the other a tenor of vague provenance–displace any more-than-buddy feelings by singing about a beautiful, absent woman (seriously, this duet occupies Don Carlo/Posa territory of subtext). Bizet obviously knew that he found the big hit with this duet. Its main theme is associated with absent lady Léila, who is the female part of the plot’s love triangle and isn’t absent for much longer (like Mr. Tenor in the beginning of this opera, people in The Pearl Fishers have a way of showing up exactly when they are required). This association means we get to hear it plenty more times, though usually in the orchestra. You get your money’s worth with that duet. Unfortunately in the rest of the opera you can see why the Met hasn’t performed this one for a century. The Met’s new production showcases a score with many beautiful moments beyond the duet, but the opera itself comes across as clunky and without any emotional weight. Penny Woolcock’s production is better than I expected having read its London reviews (it was first performed at the English National Opera several years ago), but it and a somewhat mismatched cast don’t really make a convincing argument for this piece. There are worse ways to pass an evening, but it’s underwhelming. Here, I’m going to try to figure out why I thought this. The Met’s new production of Lulu reminded me of something that might seem only a detail of the opera’s overstuffed plot: Dr. Ludwig Schön owns and edits a newspaper. In the fin-de-siècle, newspapers were the ultimate and ubiquitous marker of bourgeois respectability. They shaped their readers’ daily experience of the world. We see this in Lulu: Lulu’s dance career is made by Schön’s paper, and news frequently arrives via newsprint. The Acrobat insults Schön’s paper as a “Käseblatt” (literally “cheese paper,” meaning poor boulevard press) but I imagine it must be a middlebrow broadsheet, part of Schön’s own facade of propriety. These are the papers that critics like Karl Kraus—whose scowl looms over this production at one point—condemned as pernicious and hypocritical, an instrument of the powerful which concealed more than they reveal.